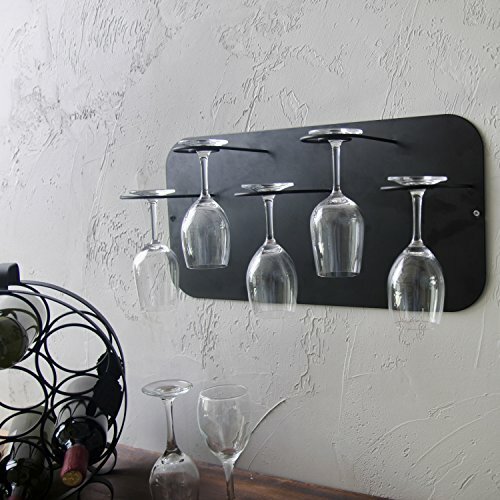 Keeping a small party's worth of stemware conveniently and stylishly stored on the kitchen or bar wall, this unique wine glass holder in black metal is an essential accessory for every oenophile. Five spiral-ended arms provide a secure hold on wine glasses or champagne flutes by their bases (typically the thickest part of the glass), storing them in an inverted position for optimal drying and prevention of dust settling in the bowl. When it's time to pour a glass, an elegant circular swirl through the spiral releases the stem, adding a bit of style to the ritual of sharing a bottle with guests.